Isaac Asimov is the writer you immediately think of when you hear the word “robot”, but Asimov was barely out of his diapers when the word was first used in a literary work – by the Czech author Karel Čapek in his 1921 play R.U.R. (Rossum’s Universal Robots). It comes from “robota” which means mundane labour of the sort that’s better suited to machines than to thinking human beings, and it’s central to one of the big themes of Čapek’s writing – mass production as a vessel for dehumanisation. Čapek's 1936 novel War with the Newts can be categorised as belonging to the still-nascent genre of science fiction, but it’s also one of the most incisive political satires I’ve read. This imaginative and playful work centres on the discovery – near a Sumatran island – of an unusually intelligent species of marine newts or salamanders. An enterprising captain teaches the creatures to use tools and even to speak, and as news of their existence spreads the world responds in a variety of ways. Soon secret temples for salamander worship arise, various existing doctrines are re-moulded to accommodate the new animals, and fashionable youngsters on Californian beaches start bathing in sea-creature costumes (“three strings of pearls and nothing else”). At the same time more practical-minded businessmen breed the newts in the millions and put them to work, even creating a syndicate for huge engineering projects that will link continents and supposedly create a Utopia on earth. 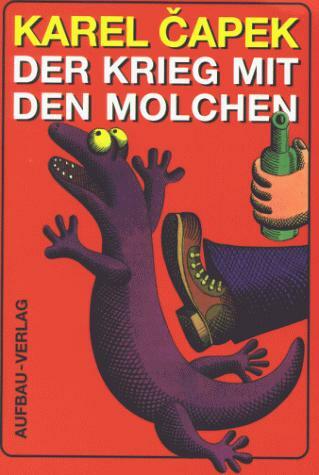 This in turn leads to much speculation about newts’ rights and what languages they should be made to learn first; a German doctor proclaims the “ur-original German Salamanders” to be racially purer than other newts, an obvious reference to political developments of the time. 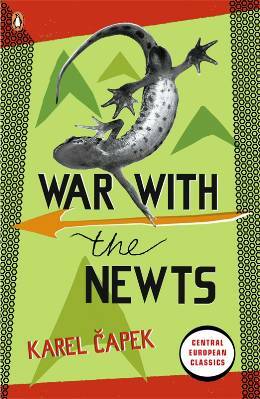 War with the Newts is narrated mainly in the third person, and in the style of anthropological reportage, but there are many tonal shifts and asides: from transcripts of newspaper clippings to a first-person account of the horrendous experiments conducted on the newts to a hilarious series of quotes from public figures of the time. (“They certainly haven’t got a soul. In this, they agree with men – G B Shaw”. “We can learn a lot from them, especially for swimming long distances – Johnny Weissmuller”.) The longest and most ambitious chapter “Along the Steps of Civilisation” has footnotes that are so elaborate they frequently take up most of the space on the page! This is a very funny book in parts, and I have to admit that the humour was my first point of engagement with it (don’t miss the use of stream-of-consciousness in the chapter where a shallow young man named Abe - the son of a rich movie magnate - and his narcissistic girlfriend Li encounter the semi-literate newts on a beach). But it's also a far-reaching novel of ideas, a comment on human hypocrisies, the hegemony of some groups over others, the whimsical ways in which our civilisation – with its many differentiated races, countries, classes and communities – has been organised, and our complete disregard for (or inability to see) the lessons of history. Bellomy shrugged his shoulders. “Newts are newts,” he grunted evasively. I lost that game. It suddenly struck me that every move in chess was old and had already been played by someone. Perhaps our history has already been played too, and we shift our figures with the same moves to the same checks as in times long past. It is quite likely that just such a decent and reserved Bellomy once rounded up Negroes on the Ivory Coast, and shipped them out to Haiti or to Louisiana, letting them peg out in the steerage. He didn’t think anything wrong with it then, that Bellomy. Bellomy never thinks anything wrong. That’s why he’s incorrigible. As you can imagine, some of the content is polemical. I don’t think Čapek is attacking any single political, economic or social system (both capitalism and communism are grist to his mill, for example), but War with the Newts can certainly be read as a critique of systems in general, and how decadent any of them can become over time. In one significant chapter, a philosopher named Wolf Meynert makes the cynical suggestion that heterogeneity is not conducive to happiness. Nations, professions, classes cannot live together permanently without crowding in upon each other, getting in each other’s way to the point of suffocation. Either live for ever apart – something that would only be possible if the world were big enough – or in opposition, in a struggle for life and death. [...] We have created a fiction of mankind which includes us and “the rest” in some sort of imaginary higher unity ... It was magnanimous conceit. And for this supreme idealism the human race will now pay with its inexorable disintegration. The range of ideas covered in this book is dizzying, and difficult to process in a single reading; so sharp and persuasive is Čapek’s examination of the human condition that when hostilities finally break out between the competing species and the Chief Salamander addresses humans with the words “Hello, you men. You will work with us in demolishing your world. Thank you”, it almost seems like a reasonable request. If human beings are diabolical enough to take an innocuous creature and reshape it in their own image – well, they may as well face up to the unpleasant results. P.S. The Czech have a cinematic tradition of low-key satires or allegories, including such fine films as Milos Forman’s The Fireman’s Ball and Jiří Menzel’s Closely Watched Trains. Here’s an old post I wrote on the latter. And here's a post about John Wyndham's novel The Day of the Triffids, a "logical fantasy" that's similar to War with the Newts in some ways. hey. would love to read this. Is it in print? guy who changed the german cover for the english version is a tard. Chicu: yes, there's a new edition that's part of a very good-looking Central European Classics series by Penguin - see this page. Hey! Thanks for this. I will have to get to this author soon.I wonder hwo much asimov was influenced by him, especially given asimov's talent for dry humour. The irony of the chess analogy is that that very aspect of repetition and patterns makes it possible for "robot chess players" to routinely beat humans today. Again, you make me wish I could pick up the book sometime soon. Given how often I run into this feeling on this blog, I'm beginning to wonder if this has more to do with your writing (the lens) than the books/movies (the objects) you write about. I haven't been disappointed with the suggestions I've followed until now (the most recent being 'Empires of Indus'), so this remains an unproven hunch. I hope it stays that way, of course! I was in Prague in April - Prague Spring!. The bookstores are full of Capek, while I was without a place to watch the World Cup. Sadly, there wasn't anything in English, & anyway I wasn't familiar with any of his works except RUR. There were many cheap DVDs though, & I bought Jiri Menzel's Larks On A String & Cutting It Short, as well as Forman's Loves Of A Blonde (which is available in a good Criterion transfer btw). I had watched Menzel's 'I Served The King Of England' before the trip, & my advise is to watch Menzel back to back, since his is somewhat of an acquired taste, but one the mood gets you (& it won't take long) it is a great way to spend the time. All the Menzel movies I mentioned above were cowritten with Bohumil Hrabal, so the thematic consistency (those 3, & also 'Closely Observed Trains) may have come from there too. I am coming in after some time, so a lot of reading to catch up on. Yea! PS: Just remembered that Adrian Mole was once obsessed with newts. Parmanu: thanks - and I hope it stays that way too, though I always maintain that the purpose of my reviewing isn't to provide blanket recommendations.